Are you looking for reliable quality Canadian made welding hats for work? A unique thing about Kootenay Hats© is that we offer a stylish hat design which has much reduced the excessive materials in the crown and temple areas. We use quilting quality cotton fabrics and carry different patterns and themes. These hats are compact in size and can be folded up nicely in your pocket so you will never leave home without them! Hot slag, molten metal, flying sparks, heat burns, UV radiation, open flames are created in welding. Cases of permanent ear damage to welders are reported to WorkSafe due to hot slag particles. It is documented these hot slag enter the welders’ ear canals and burn their ear drums, leading to ear infections, hearing loss, ringing in the ears, and balance problems. These painful burns can take a very long time to heal properly. And in some cases, surgery may be needed. Welders are at risk of ear damage from hot slag and should cover your ears when welding. Our Hats protect your ear drums against hot slag particles. They also give added protection to your ears, eyes, face from hot slag, flying sparks, flash burn and UV radiation, and prevent injuries under your helmets. Loose hair entangled in moving machinery or equipment or when exposed to means of ignition are extremely dangerous. Our Hat is a hair enclosure and gives protection to your head. It encloses all your loose hair and prevents hair entrapped in machinery and equipment. It also prevents your hair from spark burns. Kootenay Hats© can solve these problems. Many jobs required working in the heat doing heavy physical work. Heat stress can cause heat exhaustion and heat stroke, and lead to fatal conditions. Our Hat is made of 100% cotton fabrics and is extremely breathable under your hard hat. It absorbs perspiration, and prevents excessive sweat from rolling down your face and eyes. It helps to prevent heat stress by reducing the body temperature and regulate your body’s cooling system on hot days. Sun exposure. Long exposure to harmful ultraviolet A (UVA) and ultraviolet B (UVB) rays from the sun can cause sunburn and eventually lead to cancer. When working in the hot sun, our Hat protects your neck from sunburn when the brim is worn at the back. Kootenay Hats© can also solve these problems. Our Hat improve the comfort of your head hugely when you put on your welding helmet or the hard hat. It has a comfortable design and provides unrestricted vision and movement. They are custom made to fit different head sizes. The 100% cotton material is non irritating to the skin, and are cleanable. All our hats are custom made in Canada, and is a desirable piece of PPE. See our Happy Customers and Buy Now. Or Visit Individual Buyers and Corporate Buyers to find out more. 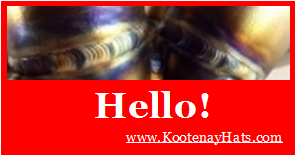 Welcome to Kootenay Hats© Soft Protective Headwear and thanks for stopping by! If you're looking for comfortable, beautiful, truly protective Welding Hats, you've come to the right place. Come browse our site here.